BAKFLIP F1 - Complete Vehicle, Inc.
You can Drive With the BakFlip F1 Open Or Closed In Any Position, and it Improves Gas Mileage By Up To 11%. The Worlds Lowest Profile Cover, The BakFlip F1 Easily Installs In Minutes Without Drilling! You can Operate the BakFlip From Either Side Of The Truck, and it now includes the BakBox, Bak Industries Collapsible under tonneau tool box. 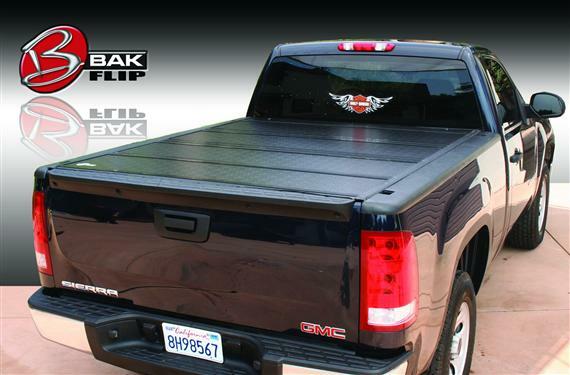 Capable of handling up to 400 lbs the BakBox is the ideal companion to your BakFlip tonneau cover and this combo kit gives you everything in one easy to install package!